An optical-based method is proposed for measuring the glucose concentration of samples containing scattering particles. In the proposed approach, a Stokes–Mueller reflection-based polarimetry technique is used to solve the Mueller matrices of a turbid glucose sample with circular birefringence and depolarization properties given six incident lights with different polarization states. Using an error function defined as the difference between the simulated output Stokes vectors and the experimental ones, a genetic algorithm is used to inversely derive the optical rotation and depolarization parameters of the experimental sample corresponding to the glucose concentration and scattering depolarization effect, respectively. The validity of the proposed method is demonstrated using glucose samples containing 0.02 ml and 0.04 ml lipofundin, respectively. H. D. Park, K. J. Lee, H. R. Yoon, and H. H. Nam, “Design of a portable urine glucose monitoring system for health care,” Comput. Biol. Med. 35, 275–286 (2005). M. J. Tierney, Y. Jayalakshmi, N. A. Parris, M. P. Reidy, C. Uhegbu, and P. Vijayakumar, “Design of a biosensor for continual, transdermal glucose monitoring,” Clin. Chem. 45, 1681–1683 (1999). K. Maruo, M. Tsurugi, J. Chin, T. Ota, H. Arimoto, Y. Yamada, and Y. Ozaki, “Noninvasive blood glucose assay using a newly developed near-infrared system,” IEEE J. Sel. Top. Quantum Electron. 9, 322–330 (2003). D. I. Ellis and R. Goodacre, “Metabolic fingerprinting in disease diagnosis: biomedical applications of infrared and Raman spectroscopy,” Analyst 131, 875–885 (2006). Y. Liu, Y. Ying, H. Yu, and X. Fu, “Comparison of the HPLC method and FT-NIR analysis for quantification of glucose, fructose, and sucrose in intact apple fruits,” J. Agric. Food Chem. 54, 2810–2815 (2006). K. Fuchs and U. Kaatze, “Molecular dynamics of carbohydrate aqueous solutions. dielectric relaxation as a function of glucose and fructose concentration,” J. Phys. Chem. B 105, 2036–2042 (2001). G. X. Zhou, J. M. Schmitt, and C. E. Ellicott, “Sensitive detection of optical rotation in liquids by reflection polarimetry,” Rev. Sci. Instrum. 64, 2801–2807 (1993). S. Jang and M. D. Fox, “Optical glucose sensor using a single Faraday rotator,” Proceedings of the IEEE 23rd Northeast Bioengineering Conference, Durham, New Hampshire, 21–22 May, 1997. B. D. Cameron, J. S. Baba, and G. L. Cote, “Optical polarimetry applied to the development of a noninvasive in-vivo glucose monitor,” Proc. SPIE 3923, 66–77 (2000). C. C. Liao and Y. L. Lo, “Extraction of anisotropic parameters of turbid media using hybrid model comprising differential-and decomposition-based Mueller matrices,” Opt. Express 21, 16831–16853 (2013). F. Boulvert, B. Boulbry, G. Le Brun, B. Le Jeune, S. Rivet, and J. Cariou, “Analysis of the depolarizing properties of irradiated pig skin,” J. Opt. A 7, 21–28 (2005). 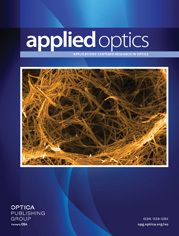 E. Hecht, Optics (Addison-Wesley, 2002). R. M. A. Azzam and N. M. Bashara, Ellipsometry and Polarized Light (North-Holland, 1977). S. Y. Lu and R. A. Chipman, “Interpretation of Mueller matrices based on polar decomposition,” J. Opt. Soc. Am. A 13, 1106–1113 (1996). S. M. F. Nee and T. W. Nee, “Polarization of scattering by a rough paint surface,” Proc. SPIE 4780, 88–98 (2002). Z. Michalewicz, Genetic Algorithm + Data structure = Evolution Programs (Springer-Verlag, 1994). T. C. Yu and Y. L. Lo, “A novel heterodyne polarimeter for the multiple-parameter measurements of twisted nematic liquid crystal cell using a genetic algorithm approach,” IEEE J. Lightwave Technol. 25, 946–951 (2007). G. L. Cote, M. D. Fox, and R. B. Northrop, “Noninvasive optical polarimetric glucose sensing using a true phase measurement technique,” IEEE Trans. Biomed. Eng. 39, 752–756 (1992). M. Kohl, M. Essenpreis, and M. Cope, “The influence of glucose concentration upon the transport of light in tissue-simulating phantoms,” Phys. Med. Boil. 40, 1267–1287 (1995). J. S. Maier, S. A. Walker, S. Fantini, M. A. Franceschini, and E. Gratton, “Possible correlation between blood glucose concentration and the reduced scattering coefficient of tissues in the near infrared,” Opt. Lett. 19, 2062–2064 (1994). J. T. Bruulsema, J. E. Hayward, T. J. Farrell, M. S. Patterson, L. Heinemann, M. Berger, T. Koschinsky, J. Sandahl-Christiansen, H. Orskov, M. Essenpreis, G. Schmelzeisen-Redeker, and D. Böcker, “Correlation between blood glucose concentration in diabetics and noninvasively measured tissue optical scattering coefficient,” Opt. Lett. 22, 190–192 (1997). Fig. 1. Experiment setup for the measurement of Mueller matrices of turbid media. Fig. 2. Propagation of light through the simulating phantom in the reflected optical system. Fig. 3. Flowchart showing GA-based method for extracting CB and depolarization properties of the glucose sample. Fig. 4. Detailed flowchart showing population construction and error evaluation components of the GA optimization scheme. Fig. 5. Comparison of the extracted optical rotation angle and input optical rotation angle for pure glucose aqueous solution with no scattering effects (the incident angle of the illuminating light was set as 65° and 70°). Fig. 6. Comparison of the extracted optical rotation angle and input optical rotation angle for the glucose aqueous solution with scattering effects (the incident angle of the illuminating light was set as 65° and 70°). Fig. 7. Variation of the optical rotation angle with glucose concentration for pure glucose aqueous solutions with no scattering effects (the incident angle of the illuminating light was set as 65° and 70°). Fig. 8. Variation of the optical rotation angle with glucose concentration for glucose aqueous solutions containing 0.02 ml lipofundin (the incident angle of the illuminating light was set as 65° and 70°). Fig. 9. Variation of the optical rotation angle with glucose concentration for glucose aqueous solutions containing 0.04 ml lipofundin (the incident angle of the illuminating light was set as 65° and 70°). Fig. 10. Variation of the degree of depolarization with glucose concentration in samples containing 0.02 ml and 0.04 ml lipofundin. (5) [ M r ] = ( 1 1 0 0 0 0 1 i 0 0 1 − i 1 − 1 0 0 ) ( r 11 r 11 * r 11 r 21 * r 21 r 11 * r 21 r 21 * r 11 r 12 * r 11 r 22 * r 21 r 12 * r 21 r 22 * r 12 r 11 * r 12 r 21 * r 22 r 11 * r 22 r 21 * r 12 r 12 * r 12 r 22 * r 22 r 12 * r 22 r 22 * ) × ( 1 1 0 0 0 0 1 i 0 0 1 − i 1 − 1 0 0 ) − 1 . (9) D = 1 − P = 1 − P x 2 + P y 2 + P z 2 .